RMCT Awarded "Colorado Parent" Family Favorites 2015 for the 6th Time! Rocky Mountain Conservatory Theatre was once again awarded "Colorado Parent" magazine's Family Favorites 2015 as winner in the 'Children's Theatre Company or Workshop' category! Thanks one more time to all of our wonderful and loyal families and patrons! RMCT Awarded "Colorado Parent" Family Favorites 2013 for the 5th Year in a Row! Rocky Mountain Conservatory Theatre was once again awarded "Colorado Parent" magazine's Family Favorites 2013 as winner in the 'Children's Theatre Company or Workshop' category! Thanks to all of our wonderful and loyal families and patrons! RMCT Awarded "Colorado Parent" Family Favorites 2012 for the 4th Year in a Row! Rocky Mountain Conservatory Theatre was once again awarded "Colorado Parent" magazine's Family Favorites 2012 as winner in the 'Children's Theatre Company or Workshop' category! Thanks to all of our wonderful and loyal families and patrons! RMCT Awarded "Colorado Parent" Family Favorites 2011 in 2 Categories! Rocky Mountain Conservatory Theatre was awarded "Colorado Parent" magazine's Family Favorites 2011 as top winner in two different categories: 'Children's Theatre Company or Workshop' & 'Summer Daycamp'! Thanks again to all who voted for us. September 1, 2010 - Whether they end up becoming great actors or not, every kid can benefit from taking an acting class, says DU theater Assistant Professor Anthony Hubert. Four years ago, shortly after coming to DU, Hubert and his wife, Jamie Roehrig-Hubert, founded the Rocky Mountain Conservatory Theatre, a youth theater company that runs summer camps and weekend workshops at DU. The camps ran for three years in Margery Reed Hall before moving to the Newman Center for the Performing Arts this summer. Kids ages 6–17 come from as far away as Mexico and Germany (though most are from Denver) to study acting basics and stage their own versions of musicals such as West Side Story, Guys and Dolls and Charlie and the Chocolate Factory. Campers learn all aspects of putting on a show; each day is divided into several classes with rotating activities, such as acting, music, dance, art and rehearsal. 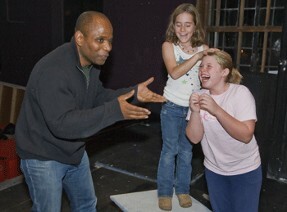 Hubert has been working with kids for 25 years, but he’s an accomplished theater professional in his own right. He’s directed 20 plays and starred in 16 others, and he was a guest star on TV shows such as “Sins of the City,” “Safe Harbor” and “Sheena.” A playwright as well, he just finished writing a screenplay about his father. Hubert now looks to inspire other young people in the same way. Whether he’s working with DU students or his theater campers, he says it’s rewarding to see their skill and confidence grow. June 22, 2010 - The Newman Center for the Performing Arts is swarming with kids who will put on six performances in the next eight weeks. The Rocky Mountain Conservatory Theatre is hosting its summer camps for children ages 6–17. 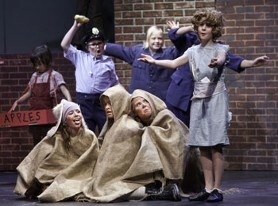 The children have been practicing since June 7 and stage their first performances on June 24. It is the first year conservatory co-founder Anthony Hubert has divided the children into smaller groups, so that each group has its own production. It’s also the first time they’ve used the Newman Center’s Byron Flexible Theater. Children ages 6–8 are putting on the Pied Piper for the first session. The 9–12 year-olds are doing Charlie and the Chocolate Factory and the older group, ages 13–17, will produce West Side Story. Ryan Maltz, 15, has come to camp for the second year and will play Bernardo, the leader of the Sharks in West Side Story. He says he’s enjoyed camp this year even more than last. “Because we’re separated from the younger kids, we get to work with each other more and focus a lot more on our characters,” he says. The first three productions will run from June 24–26. A new group of children will start the second session, which runs June 28–July 17. The second group will perform The Jungle Book, Guys and Dolls and A Midsummer Night’s Dream. RMCT Awarded "Colorado Parent" Family Favorites 2010 in 2 Categories! Rocky Mountain Conservatory Theatre was awarded "Colorado Parent" magazine's Family Favorites 2010 as top winner in two different categories: 'Children's Theatre Company or Workshop' & 'Summer Daycamp'! Thanks again to all who voted for us. 5/8/10 - Opening remarks by Queen Elizabeth, Mary Queen of Scotts, and William Shakespeare are supplemented by Dennis Gallagher's performance of the most famous Shakespeare sonnet and also the Grand Marshall's comments. Grand Marshall Anthony Hubert seems to be having as much fun as anyone, even anticipating so many candidates for his own productions of the Rocky Mountain Conservatory Theatre. Approximately 4,000 Denver Public School students participated in the festivities May 6, 2010, including the parade which gets traction after all those speeches! But if you look carefully, there are many swords flashing even before the start time, and many beautiful young maids as plentiful as the May flowers. Keep tune for upcoming "visions" of more hours of performances. Join us for the closing of Preschool One Book, One Denver and listen to local celebrities such as Jennifer Zeppelin and Alan Gionet from CBS4 read "The Very Hungry Caterpillar" by Eric Carle to children! On April 28th from 12:00 p.m. to 2 p.m. the Children's Museum of Denver is hosting a reading extravaganza of the kids classic "The Very Hungry Caterpillar" with local celebrities! Families will cozy up and listen to the story and enjoy stellar performances of the Rocky Mountain Conservatory Theater as they act out the book alongside the readers. March 18, 2010 - Anthony Hubert, professor and co-founder of the Rocky Mountain Conservatory Theatre, is hosting his children’s camps at the Newman Center this summer. 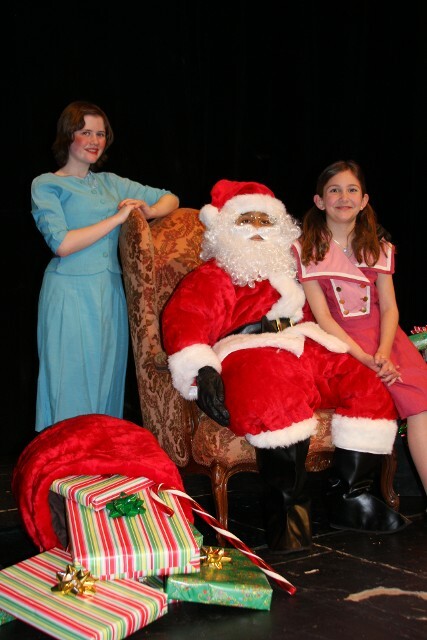 December 8, 2009 - Nearly 40 children plan to convince audiences that Santa Claus is real in Miracle on 34th Street at the University of Denver’s Little Theatre beginning Dec. 11. “It’s a show about hope, faith and believing in something so much it brings it into truth,” Hubert says. Heather Taylor, 13, will play Doris Walker, the no-nonsense mother who hires Kris Kringle to work at Macy’s but does not want her daughter to believe in Santa. Actors in the production range in age from 7 to 17. 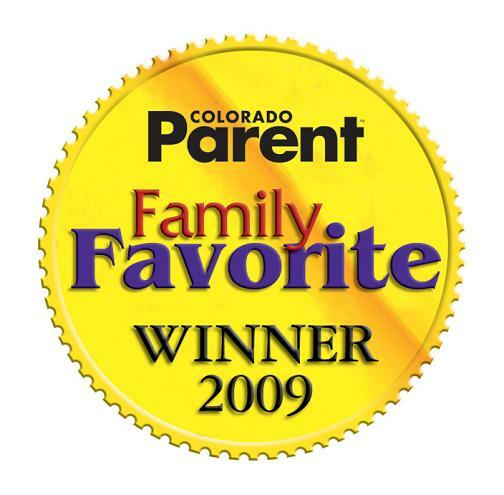 RMCT Awarded "Colorado Parent" Family Favorites 2009 in 2 Categories! Rocky Mountain Conservatory Theatre was awarded "Colorado Parent" magazine's Family Favorites 2009 as top winner in two different categories: 'Children's Theatre Company or Workshop' & 'Summer Daycamp'! Thanks fo all who voted for us. Rocky Mou ntain Conservatory Theatre was awarded the prestigious "Kids Pages" Best Places for Families 2008 in the 'Best Theatre Classes' category. More than 200,000 people voted in the Denver metro area! We thank all of our Families & Friends. July 16, 2009 - It’s summertime and the kids are bored at home all day. This boredom could lead to trouble. That’s why DU professor Anthony Hubert started a day-camp theater program that takes place for two months each summer on campus. Hubert and his wife, Jamie Roehrig-Hubert, founded the Rocky Mountain Conservatory Theatre (RMCT) three years ago, the same year Hubert became an assistant professor of acting and directing at DU. Hubert also is the head of recruiting for the theater department. RMCT offers two sessions each summer, and performs a different show each session. This summer’s first session recently performed Peter Pan, while the current session will be performing Annie Jr. Since the theater started three years ago, the number of students has steadily increased. The first year, RMCT had 34 campers, the second year 108 and this year there are 205. Hubert says he expects the number to continue to grow and will split next year’s camp into three different age groups. The camp has many ties to DU. Seven of the nine camp counselors are DU students and around 40 percent of the young thespians at the camp have parents that work at DU or are DU alumni. Many campers also have a sibling attending DU or the Ricks Center. Hubert employs the DU students for the summer because he wants them to see how to run all aspects of a theater effectively. “I want them all to have a bag of tools they can go out into the world with,” Hubert says. Hubert also strives to educate the younger generations about the performing arts industry. Campers do everything it takes to put on a show. Each day is divided into several classes with rotating activities, such as acting, music, dance, art and rehearsal. Nickelodeon’s Parent Picks’ Awards has nominated the Rocky Mountain Conservatory Theatre in the categories of best day camp and best theatre group for kids. The results will be released Aug. 17 and available at http://gocitykids.parentsconnect.com. RMCT also offers Saturday classes and a holiday show during the school year. This year’s holiday show will be Miracle on 34th Street. Annie Jr. will take place in Margery Reed Hall in the Little Theatre at the University of Denver campus. June 25, 2008 - While Dorothy and Toto are learning the ways of Oz, four DU students and two recent graduates are learning how to put on an all-youth production of The Wizard of Oz. It’s the idea of the play’s director, Anthony Hubert, an assistant professor in DU’s theatre department and co-founder of the Rocky Mountain Conservatory Theatre. “They are learning how to run a theater and how it runs in the real world,” Hubert says. Alex Ngo, a junior theater and biology major, is Hubert’s assistant director for the show. The production is part of the conservatory’s three-week summer camp for children ages 5–17. At camp’s end, there are four live performances. 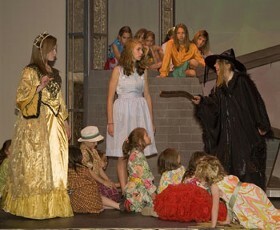 The campers will perform The Wizard of Oz June 26–27 and Alice’s Adventures in Wonderland July 17–18. Hubert is preparing Ngo to direct the second summer camp and production. He gave Kate Smith, a senior music and theater major, the position of musical director and choreographer. Smith wants to be a director one day and believes her experience with the conservatory is invaluable. “I feel like if I can direct 58 kids, I will be able to handle adults in the future,” she says. The Wizard of Oz opens June 26 at 11:30 a.m. in the Little Theatre in DU’s Margery Reed Hall. December 21, 2007 - Anthony Hubert co-founded the Rocky Mountain Conservatory Theatre with his wife, Jamie Roehrig-Hubert. Anthony Hubert is an idea man; his wife, Jamie Roehrig-Hubert, makes it happen. He wanted to start an organization that specialized in teaching theater to children and young adults. Six months later, his wife formed the Rocky Mountain Conservatory Theatre. The couple moved to Denver in August 2006 for Hubert’s position as assistant professor of acting and directing in DU's theater department. Hubert works with the students; Roehrig-Hubert does everything else from enrollment to Web site design. The dream started years ago when growing up in the projects of Atlanta, Hubert’s mother signed him up for any free program she could find. While Hubert enjoyed the acting lessons, he always came back to teach his friends whatever he learned, from acting to tennis. And while teaching is his passion, Hubert’s had plenty of professional experience in television, film and the stage. He’s directed 20 plays and starred in 16 others. 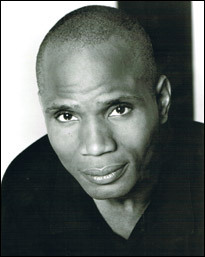 He’s also played Donald in the movie Sweat and was a guest star on the shows Sins of the City and Sheena. Roehrig-Hubert has no interest in show business but is pursuing a bachelor’s degree in business administration at DU. She wanted to use her administrative and marketing skills for the Rocky Mountain Conservatory Theatre because of her 7-year-old daughter. The conservatory’s mission is to teach youth the skills they need to cultivate healthy relationships, build self-esteem and generate positive attitudes through working in theater. Since the conservatory’s start, they’ve hosted a summer camp, acting classes and this December, an all-youth production of A Christmas Carol. Lorenzo Lucero, 11, plays Bob Cratchit, the abused clerk of Ebenezer Scrooge, in A Christmas Carol. Lucero was blown away by Hubert’s performance in a recent DU production of Othello and wanted to learn from him. While the conservatory is open to any applicant ages 6 to 18, Roehrig-Hubert would like to pursue grants or donations to sponsor children who couldn’t afford to come. Hubert would like to give children the same opportunity he was afforded. An All-Youth Cast to Perform "A Christmas Carol"
December 07, 2007 - An unconventional cast will take the stage at the University of Denver's Little Theater in an upcoming production of A Christmas Carol. Every actor will be under 18 years of age. The 24 cast members, who range in age from 6 to 18, auditioned and were selected by Director Anthony Hubert, assistant professor in DU’s theater department. Hubert’s passion is teaching children life-skills through theater performance, which is why he and his wife, Jamie Roehrig-Hubert, founded the Rocky Mountain Conservatory Theatre (RMCT). A Christmas Carol will just be the first all-youth performance staged by the RMCT. Emilie Bickel, 13, plays Ebenezer Scrooge in the production. She’s learning how to articulate ideas, how to take direction and how to mentor younger children. She plans to use what she’s learned in a future career. The show opens Dec. 14. For a full list of performance dates and times, please visit the RMCT website. 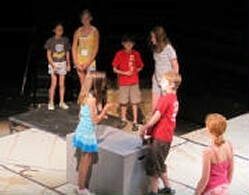 June 07, 2007 - This summer, DU’s Rocky Mountain Conservatory Theatre will host a new theater camp for youth ages 6–16. Assistant Professor Anthony Hubert will lead two three-week sessions June 11–29 and July 2–20, during which children will learn and practice putting on a musical show. “My camps are really an immersion into the creative spirit,” Hubert says. During the summer camps in Margery Reed Hall, students will learn movement, voice training, acting, dance and art. Each camp will culminate in three performances, in which every child will have a role. The musicals to be performed include 101 Dalmatians, and Aladdin. There are discounts for sibling registrations and for children of DU faculty and staff. 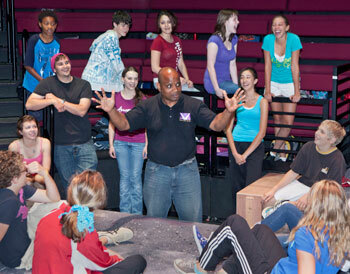 Hubert, who joined DU’s theatre department last fall, has instructed youth for more than 20 years. “Working with youth is not just a responsibility but a passion for me,” Hubert says. Hubert says he benefited from adults who taught art in the Atlanta projects where he grew up. He credits those volunteers with spurring his passion for art, which led him to become a professional actor, director and artist. From his first job teaching tennis at 15, Hubert has dedicated himself to teaching youth. He says he teaches 6 year-olds and 60 year-olds the same way: He helps them to access their subconscious, to live viscerally and to realize how to attain their dreams. Those sound like big plans. But Hubert says he’s done it before. Max Fabian, 18, is one of Hubert’s protégés. At age 11, Fabian was in a production of Fiddler on the Roof. Hubert led a workshop at the Jewish Community Center and Fabian was hooked. Among Hubert’s teachings, Fabian recalls Hubert leading students in swordplay, reading Shakespeare for hours and infusing his passion for acting in every lesson. Fabian calls Hubert his “mentor” and says that Hubert helped him make the decision to attend the Chicago College of Performing Arts at Roosevelt College this fall. “He’s given me a real foundation,” Fabian says. For more information about the camps, visit the Rocky Mountain Conservatory Theatre site or call (303) 476-0222.